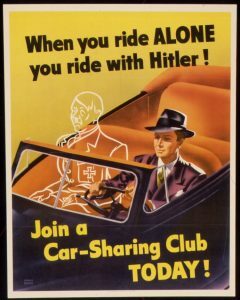 Make sure not to ride by yourself or else the Führer will be right next to you. Weimer Pursell. Painted for the U.S. Government Printing Office for the Office of Price Administration, 1943. World War II was an advancing time in history, it was an age of competition with other countries, being a step ahead in the war was important but sometimes in order to meet the demand, there had to be limitations. In the case of the United States, it was actually rubber since it was hard to mass produce. The means of saving rubber was to produce fewer tires for civilian vehicles and instead focus it all on the tanks and other war machines. A way of getting around not producing as many car tires was to limit the use of cars themselves; less wear and tear meant fewer people would ask for tire replacements resulting in more rubber for the war. Instead of going around telling people to stop using rubber, they created the idea that America needed to save gasoline for the war despite oil being plentiful and not difficult to obtain. They introduced the idea of carpooling, it was basically sharing one vehicle with multiple people that way there would be fewer cars as often since one driver could drive up to five people to work at the same time, essentially getting rid of multiple cars off the road. 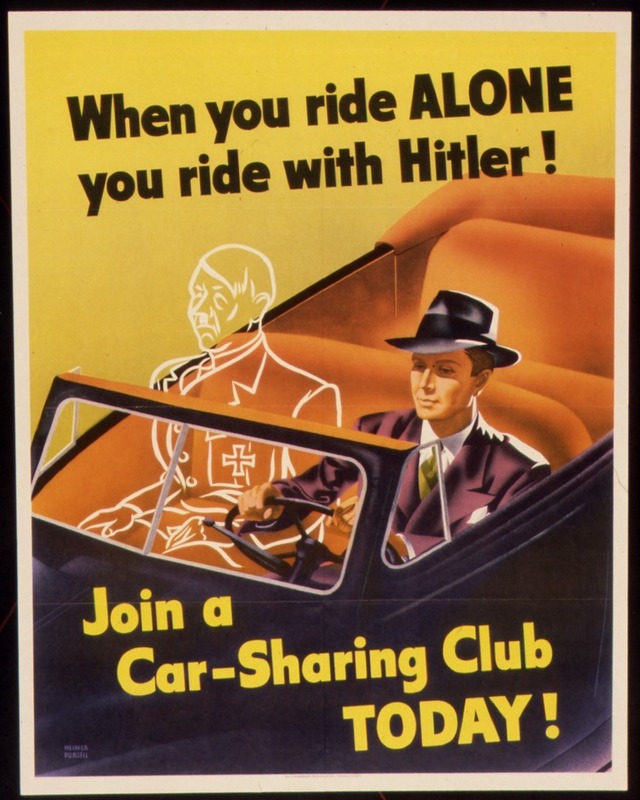 Propaganda such as my personal favourite “If you ride alone you ride with Hitler” were effective of getting people to go cruising with their neighbors’ instead of driving by themselves. With the decrease of cars on the road, rubber was no longer a scarce resource, helping America build more tanks and aiding their war efforts immensely; the idea was a complete success. Dizzy Don was a Canadian comic series known for its comedic nature of its time but also can be seen to have political undertones, more so during World War II. 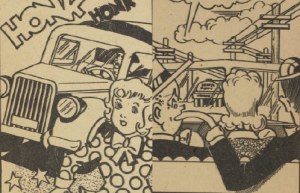 On 1944’s Issue 13 of Dizzy Don and the Black Racket, Dizzy Don and the gang have to stop a mob of black market thugs trying to sell gasoline illegally. Seems harmless until you notice all the small hints for promoting the carpooling lifestyle; Dizzy Don is seen always driving never alone but with a group of his friends meanwhile, the villains are always driving by themselves, the crooks also waste gas by blowing up vehicles or setting gasoline tanks on fire just to escape. The comic doesn’t directly tell but rather visually lets you know that to be a good guy you don’t waste fuel but if you do you’re the bad guy. It’s a smart technique to help push a motive to society, showing the protagonist perform certain actions will most likely influence fans of the series to do the same. 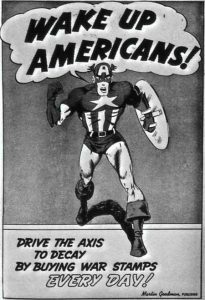 To say that carpooling paid Manny Easson to feature their propaganda in his comic is hard to say and near impossible to prove nowadays but to think that Manny Easson got influenced by the propaganda itself is quite believable. Delving into the humor of Dizzy Don, Manny Easson took inspiration of Ernie Kovacs, a famous comedian who pioneered TV comedy today with the Ernie Kovacs show. The design of Dizzy Don even took inspiration of Kovacs attire, including his stature as well. Kovacs style of humor was skit based, featuring short plots that were full of humor and quite bizarre, whether it be drowning a scarecrow, women having a drug trip on what to wear, or three apes playing instruments, it was out there, especially for its time. Easson nailed the style with Dizzy Don, it’s hard to describe it but if you had read Dizzy Don and watched an Ernie Kovacs skit you’d automatically see the resemblance, even down to the characters like Kovacs’ female companion and trusty sidekick in some of his re-occurring skits, the exact same layout as with Dizzy Don. Dizzy Don’s style of humor was quick and explosive, a lot of stuff would happen all at once but it flowed well enough that the reader wouldn’t get lost in the chaos, similar to that of a Kovacs skit. Because the humor was fast-paced, subliminal messages can be easily overlooked as each panel wasn’t meant to be viewed for too long since most of the humor came from the obvious visual gag and writing. This can result in propaganda being merged within the humor itself, such as Dizzy Don’s sidekick, Bill, blows up a gas tank full of fuel resulting in him getting blown up but in an innocent way (not dead, just Looney Tunes style), or just the abundance of car crashes in issue itself, all in done in a slapstick kind of way, but why so many? Is there a secret message being told? the answer to that question is yes. Since the issue was dated in 1944, the same time the propaganda regarding fuel conversing and carpooling was huge, also taking into consideration of Easson’s love of American television seen by his appreciation to American stars like Ernie Kovacs, resulting in absorbing more of said advertisement, I can simply say there is a high probability Easson made this issue of Dizzy Don as a means for sharing his opinion with the viewers of his comic. An author will usually put their thoughts and opinions into their works, mostly hidden through the style, in this case, the humor. For someone who isn’t into politics, they wouldn’t think much of it but rather view it as just Easson’s style of humor which it is but with a political twist. Politics and humor have always gone hand to hand, this comic is no exception. 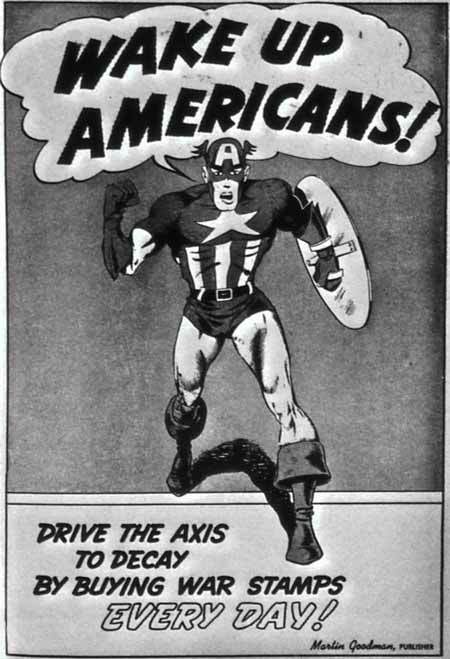 What we can take from the information we have learned is that comics and propaganda do work together to help push an idea to the public, more so during the time of WWII. It was important for comics to do such because it was this time comic books were in its prime, the number of people tuning in to the next issue was astonishing so it made sense to put forms of advertisement within a comic, including propaganda; it was a sure way of getting more people to look. Manny Easson, a fan of US television shown by his love of Ernie Kovacs style of humor, it would seem possible for his issue 13 of Dizzy Don, The Black Gas Racket, to be centered around carpooling as it was common propaganda during the time of its release. Perhaps Easson simply wanted to share his ideas, thinking it was right for him to push an idea to help out the soldiers, it was probably the most he can do. Sadly we can never know for certain if this was intentional or not, despite all the little hints pointing towards that conclusion, nothing can be confirmed. However, it’s nice to discuss Dizzy Don, it was an underappreciated comic series with a lot of passion put into it; it was sadly swallowed by the much higher budget comics during its time and was overlooked because of it, (it doesn’t even have a Wikipedia page). Hopefully, this research can shed light on a series that has been dead for ages. 1. Kelly, Mark. “The Golden Age of Comic Books: Representations of American Culture from the Great Depression to the Cold War.” Epublications, Marquette University, epublications.marquette.edu/cgi/viewcontent.cgi?article=1000&context=dittman. Kocmarek , Ivan. “Manny ‘Dizzy Don’ Easson.” Comicbookdaily, Whites Tsunami, WECA Splashes, 11 Apr. 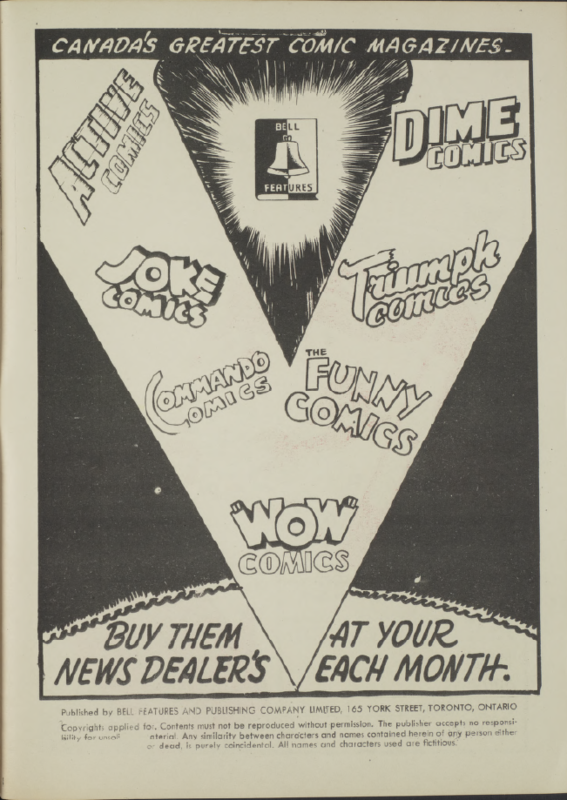 2013, www.comicbookdaily.com/collecting-community/whites-tsunami-weca-splashes/manny-dizzy-don-easson/. Kocmarek , Ivan. “Easson Find.” Comicbookdaily, Whites Tsunami, WECA Splashes, 10 Dec. 2014, www.comicbookdaily.com/collecting-community/whites-tsunami-weca-splashes/easson-find/. Long, Tony. “Dec. 1, 1942: Mandatory Gas Rationing, Lots of Whining.” Wired, Conde Nast, 29 Aug. 2017, www.wired.com/2009/11/1201world-war-2-gasoline-rationing/. Quednau, Rachel. “WWII Carpooling Propaganda.” Strong Towns, Quednau, 8 Oct. 2015, www.strongtowns.org/journal/2015/10/8/wwii-carpooling-propaganda. Viotte, Michel, director. Spider-Man – Once Upon a Time the Super Heroes. Once Upon A Time The Super Heroes , 23 Dec. 2001, www.youtube.com/watch?v=ySOOLp_SoDw.